"On December 24, 1995, as a young girl full of rebellious ideas, I was ushered into our drawing room to meet a man who could, if we pleased, become my prospective husband. As I mentioned I was rebellious, I refused to carry the customary coffee tumblers and sweets that make up the tradition of our girl-seeing* ceremony. The boy was smart, no doubt, well travelled, extremely courteous and well mannered. We introduced ourselves and spoke about innocuous things like the weather and traffic. As we had nothing outwardly annoying to say about each other, we decided to be married. And that was how I came to be known as Mrs. Viswanathan Anand. For me, he is just Anand, a simple person who loves Mexican food and has a trained sense of humour. To the world, he is Vishy, a celebrated five-time world chess champion. As a newly minted bride, our honeymoon was in Dortmund at a chess tournament. I used to cuddle up in a corner of the theatre and sleep. Every time there was applause I would wake up to see Anand walk off the stage. I would be so afraid to meet anyone's gaze as I had no idea what had happened. I would hide in the restroom and wait for Anand to call out to me. That was my first ever experience with chess. 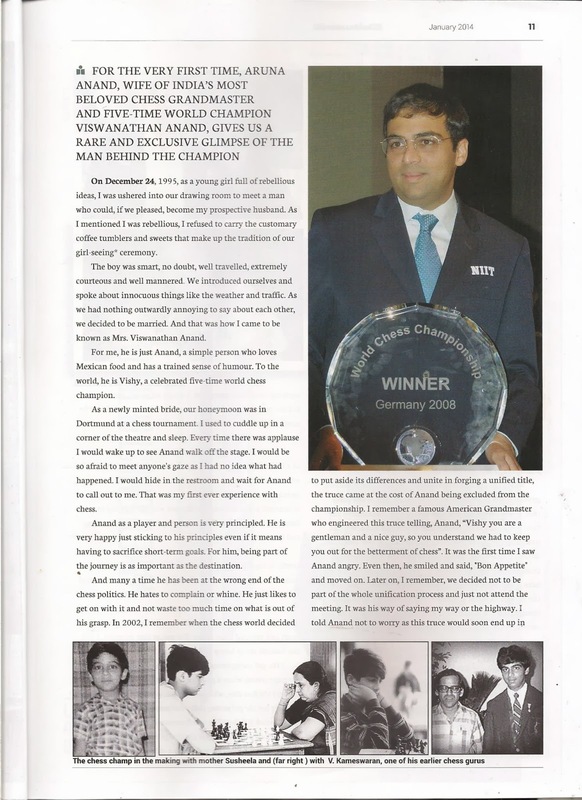 Anand as a player and person is very principled. He is very happy just sticking to his principles even if it means having to sacrifice short-term goals. For him, being part of the journey is as important as the destination. And many a time he has been at the wrong end of the chess politics. He hates to complain or whine. He just likes to get on with it and not waste too much time on what is out of his grasp. In 2002, I remember when the chess world decided to put aside its differences and unite in forging a unified title, the truce came at the cost of Anand being excluded from the championship. I remember a famous American Grandmaster who engineered this truce telling, Anand, “Vishy you are a gentleman and a nice guy, so you understand we had to keep you out for the betterment of chess”. It was the first time I saw Anand angry. Even then, he smiled and said, "Bon Appetite" and moved on. Later on, I remember, we decided not to be part of the whole unification process and just not attend the meeting. It was his way of saying my way or the highway. I told Anand not to worry as this truce would soon end up in a wastepaper basket. Sometimes a woman’s intuition holds when reason and ego are at stake . When the chess world bowed to the demands of various governments to get their wards to have a shot at the chess title, it was always Anand who had to play. I remember the time before the acrimonious title defence in Sofia. We had to undertake this 40-hour trip to Sofia across four countries as the air space was closed. Anand said just one beautiful thing to me. “You are putting everything you got on the line here. Trust me. I will get on with the job.” I think that was the moment I really treasured despite having had to drive through the pot-holed roads of Romania without cell phone coverage. The outside world did not see a man with steely grit wanting the title defence badly because he never once used the 40-hour trip as an excuse. For me, personally, winning in Sofia was the most defining moment of his career. If the world championships were the crowns, this was clearly the diamond in it. The toughest thing about Anand the person and the champion is that being a nice guy you can’t be anything but a nice guy! You have to be nice whether you like it or not. Sometimes I have seen him angry and still patiently finish replying to an irate journalist. I would often tell him to just tell the man to lump it. Anand would smile and say that if he considered the time taken to make the person understand he is angry, it would take half that to mumble the answer. 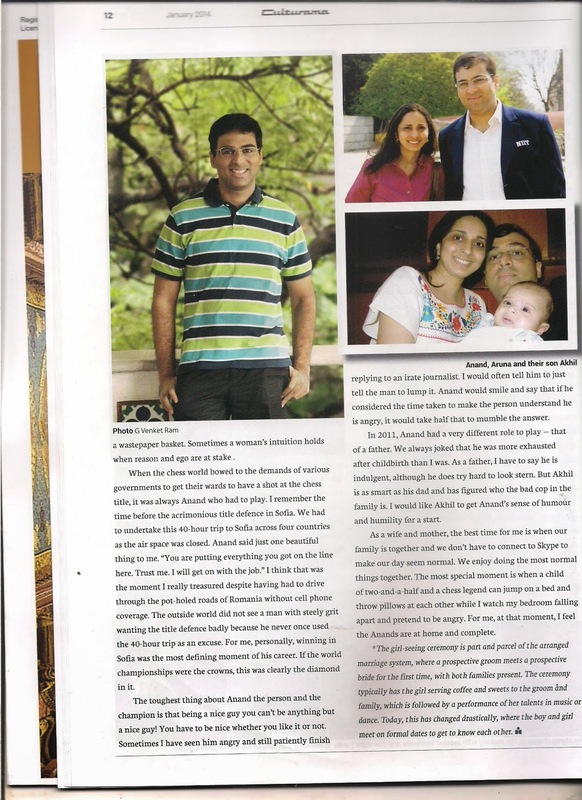 In 2011, Anand had a very different role to play — that of a father. We always joked that he was more exhausted after childbirth than I was. As a father, I have to say he is indulgent, although he does try hard to look stern. But Akhil is as smart as his dad and has figured who the bad cop in the family is. I would like Akhil to get Anand’s sense of humour and humility for a start. As a wife and mother, the best time for me is when our family is together and we don’t have to connect to Skype to make our day seem normal. We enjoy doing the most normal things together. The most special moment is when a child of two-and-a-half and a chess legend can jump on a bed and throw pillows at each other while I watch my bedroom falling apart and pretend to be angry. For me, at that moment, I feel the Anands are at home and complete. *The girl-seeing ceremony is part and parcel of the arranged marriage system, where a prospective groom meets a prospective bride for the first time, with both families present. The ceremony typically has the girl serving coffee and sweets to the groom and family, which is followed by a performance of her talents in music or dance. Today, this has changed drastically, where the boy and girl meet on formal dates to get to know each other."